Table views on iOS display a single column of vertically scrolling content, divided into rows. Each row in the table contains one piece of your app’s content. 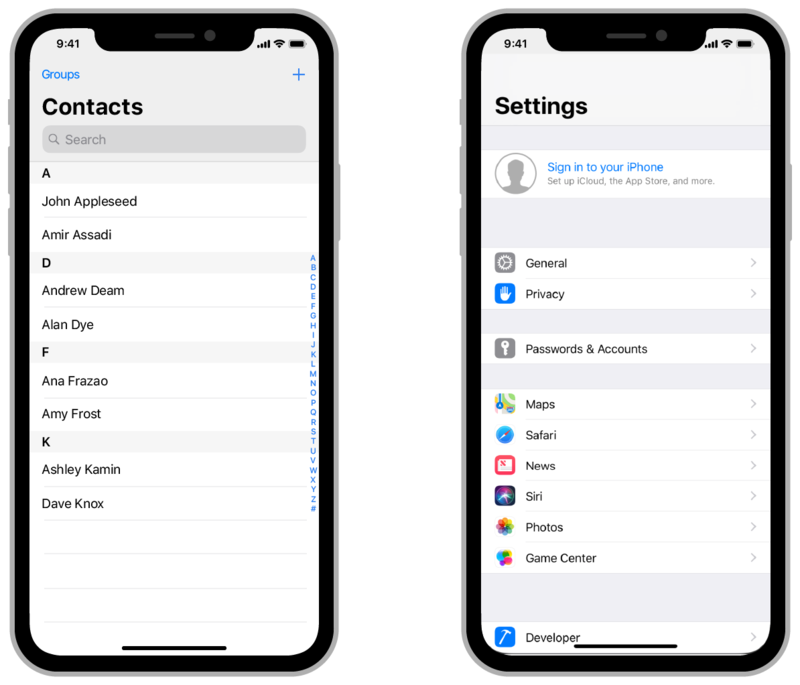 For example, the Contacts app displays the name of each contact in a separate row, and the main page of the Settings app displays the available groups of settings. You can configure a table to display a single long list of rows, or you can group related rows into sections to make navigating the content easier. Tables are commonly used by apps whose data is highly structured or organized hierarchically. Apps that contain hierarchical data often use tables in conjunction with a navigation view controller, which facilitates navigation between different levels of the hierarchy. For example, the Settings app uses tables and a navigation controller to organize the system settings. UITableView manages the basic appearance of the table, but your app provides the cells (UITableViewCell objects) that display the actual content. The standard cell configurations display a simple combination of text and images, but you can define custom cells that display any content you want. You can also supply header and footer views to provide additional information for groups of cells. To add a table view to your interface, drag a Table View Controller (UITableViewController) object to your storyboad. Xcode creates a new scene that includes both the view controller and a table view, ready for you to configure and use. Table views are data driven, normally getting their data from a data source object that you provide. The data source object manages your app’s data and is responsible for creating and configuring the table’s cells. If the content of your table never changes, you can configure that content in your storyboard file instead. For information about how to specify your table’s data, see Filling a Table with Data. Table views support UIKit app restoration. To save and restore the table’s data, assign a nonempty value to the table view’s restorationIdentifier property. When its parent view controller is saved, the table view automatically saves the index paths for the currently selected and visible rows. If the table’s data source object adopts the UIDataSourceModelAssociation protocol, the table stores the unique IDs that you provide for those items instead of their index paths. For information about how to save and restore your app’s state information, see Preserving Your App's UI Across Launches. The object that acts as the data source of the table view. The object that acts as the prefetching data source for the table view, receiving notifications of upcoming cell data requirements. Registers a nib object containing a cell with the table view under a specified identifier. Registers a class for use in creating new table cells. Returns a reusable table-view cell object for the specified reuse identifier and adds it to the table. func dequeueReusableCell(withIdentifier: String) -> UITableViewCell? Returns a reusable table-view cell object located by its identifier. Registers a nib object containing a header or footer with the table view under a specified identifier. Registers a class for use in creating new table header or footer views. func dequeueReusableHeaderFooterView(withIdentifier: String) -> UITableViewHeaderFooterView? Returns a reusable header or footer view located by its identifier. The object that acts as the delegate of the table view. The height of section footers in the table view. The estimated height of section headers in the table view. The estimated height of section footers in the table view. Returns the number of rows (table cells) in a specified section. The number of sections in the table view. func cellForRow(at: IndexPath) -> UITableViewCell? Returns the table cell at the specified index path. func headerView(forSection: Int) -> UITableViewHeaderFooterView? Returns the header view associated with the specified section. func footerView(forSection: Int) -> UITableViewHeaderFooterView? Returns the footer view associated with the specified section. func indexPath(for: UITableViewCell) -> IndexPath? Returns an index path representing the row and section of a given table-view cell. func indexPathForRow(at: CGPoint) -> IndexPath? Returns an index path identifying the row and section at the given point. func indexPathsForRows(in: CGRect) -> [IndexPath]? An array of index paths, each representing a row enclosed by a given rectangle. The table cells that are visible in the table view. An array of index paths, each identifying a visible row in the table view. An index path identifying the row and section of the selected row. The index paths representing the selected rows. Selects a row in the table view identified by index path, optionally scrolling the row to a location in the table view. Deselects a given row identified by index path, with an option to animate the deselection. A Boolean value that determines whether users can select a row. A Boolean value that controls whether users can select more than one cell simultaneously in editing mode. Inserts rows in the table view at the locations identified by an array of index paths, with an option to animate the insertion. Inserts one or more sections in the table view, with an option to animate the insertion. Deletes one or more sections in the table view, with an option to animate the deletion. The type of animation to use when rows are inserted or deleted. Moves a section to a new location in the table view. The color to use for the table view’s index text. The color to use for the background of the table view’s section index. The color to use for the table view’s index background area. A constant for adding the magnifying glass icon to the section index of a table view. A Boolean value indicating whether the table view's appearance contains changes that are not reflected in its data source. Reloads the rows and sections of the table view. Reloads the items in the index bar along the right side of the table view. The delegate object that manages the dragging of items from the table view. A Boolean value indicating whether rows were lifted from the table view and have not yet been dropped. A Boolean value indicating whether the table view supports drags and drops between apps. The delegate object that manages the dropping of content into the table view. A Boolean value indicating whether the table view is currently tracking a drop session. Scrolls through the table view until a row identified by index path is at a particular location on the screen. Scrolls the table view so that the selected row nearest to a specified position in the table view is at that position. The position in the table view (top, middle, bottom) to which a given row is scrolled. Toggles the table view into and out of editing mode. Returns the drawing area for a specified section of the table view. Returns the drawing area for a row identified by index path. Returns the drawing area for the footer of the specified section. Returns the drawing area for the header of the specified section. A Boolean value that indicates whether the table view should automatically return the focus to the cell at the last focused index path.